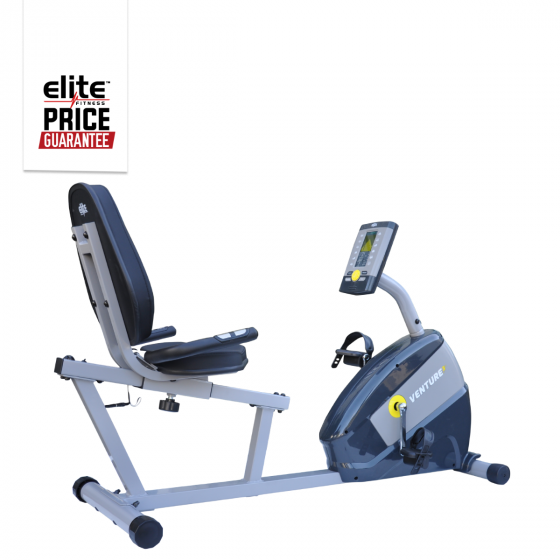 Part of the cutting edge Elite Winter Cardio Collection, the Elite Venture 3 Recumbent Exercycle has been engineered to the highest quality, the robust frame supports a maximum user weight of 120kg. The Venture 3 presents an incredibly smooth, soundless ride thanks to 6kg Flywheel and 16 levels of Silent Magnetic Resistance. This machine offers an effective, accessible workout that will continue to challenge you to improve your fitness levels, without having to leave your living room. An Adjustable Padded Seat and Handle Bar ensure a comfortable, supportive ride that fits you. Back and joint strain is kept to a minimum when in the seated position of a recumbent exercycle. Stay motivated to finish your routine! The LCD console displays your workout statistics including Speed, Distance, Calories, Watts, RPM and Pulse, keeping you focused on achieving your workout goals! *Please Note: Advertised prices may differ in-store to cover local freight. * Any cost associated with the transportation, travel or freight to, or from, a customer’s premises, is at the customers cost. This means the customer must return the machine to the point of sale, or the closest service centre before any warranty work is undertaken. * In relation to any warranty exceeding 1 year, i.e. frame, motor, electronics or parts, the warranty is for the aforementioned only and excludes labour which will be charged separately after any labour warranty has expired. Programs: Stay motivated using the 16 built-in workout programs!